James E. Jackson of New York was the husband of Esther Jackson. The two were a leading black communist couple from the late 1930s onwards. 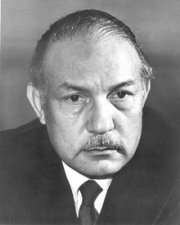 James Jackson worked as the Southern Affairs secretary for the CPUSA. At that time Jackson worked in close association with Rosa Parks, a relationship which had begun in the days of the Youth Congress and continued during the Montgomery Bus Boycott. As The Worker’s editor, Jackson worked with a number of the leaders of the civil rights revolution. Circa 1965, James Jackson was listed as the Coordinator of the Greater Boston Area Coalition to Stop S. 1437, an affiliate with the National Committee Against Repressive Legislation. On April 28, 1966 James Jackson was a sponsor of the Herbert Aptheker Testimonial Dinner. The dinner was held on the occasion of Herbert Aptheker's 50th birthday, the publication of his 20th book, and the 2nd anniversary of the American Institute for Marxist Studies. It was held in the Sutton Ballroom, The New York Hilton, Avenue of the Americas, 53rd to 54th Street, New York City. Most speakers, organizers and sponsors were known members or supporters of the Communist Party USA. James Jackson was an Executive Board member of the Communist Party USA dominated U.S. Peace Council 1983-1985-Communist Party USA representative. In 1991, James Jackson, New York, was one of several hundred Communist Party USA members to sign the a paper "An initiative to Unite and Renew the Party" - most signatories left the Party after the December 1991 conference to found Committees of Correspondence. In 1992, James Jackson, former editor The Worker, New York endorsed the Committees of Correspondence national conference Conference on Perspectives for Democracy and Socialism in the 90s held at Berkeley California July 17-19.